Tag: Wii | Something Odd! I was looking on Amazon over the weekend for PC steering wheels when I remembered that my phone could do the job! Install JD SimWheel from the Play Store, grab the device driver and server from here for your PC and you’re 90% of the way there. It might take a few minutes tinkering with the settings in-game but Euro Truck Simulator 2 works fine with it. I still can’t reverse properly but now I can take corners smoothly and two of the buttons on-screen are already configured for left and right indicators! Here’s a howto video and demonstration using the game GRID created by user MyHD2AndOthers on Youtube. Next on my todo list is using a WiiMote as a steering wheel as I already have the steering wheel adaptor for it and it should be more comfortable than holding a phone! Black Ops on the Wii looks interesting. Graphics are not as good as the PS3 or Xbox 360, but that’s to be expected. It still plays at quite a blistering pace. The wandering gun sight might make viewers sick however. It tends to jump around quite a bit! I was shocked and amazed when I saw the boxes of Call of Duty Modern Warfare in the Wii section of Gamestop the other day so I went searching for reviews. Metacritic gave it it a reasonable 77, while the following two Youtube reviews rate it very highly. Graphics look awful, and aren’t a patch on the Xbox 360 or PS3 version but the Wii remote makes aiming easier and more precise. Just added it to my Amazon Wishlist. My latest gaming purchase last week was MadWorld for the Nintendo Wii Console. It’s a horribly violent and bloody beat-em-up and saw-em-up and gauge-em-up and .. you get the idea. 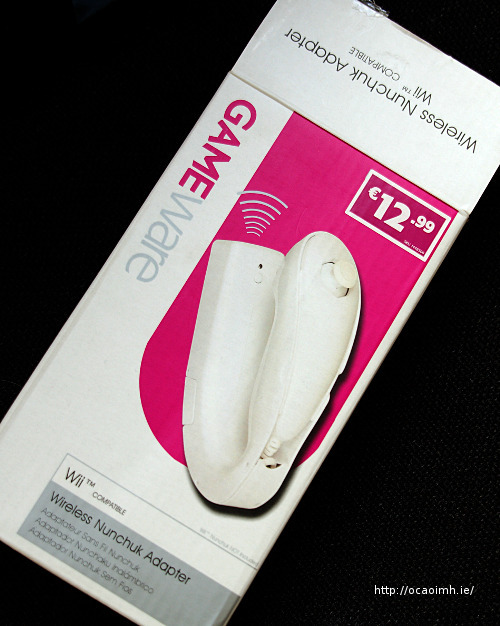 Last weekend I popped into Game for a look around and spotted the Gameware Wireless Nunchuck Adapter for a reasonable €12.99. Not bad. I also bought a Wiimote charger but I’ll blog about that at a later stage. Can’t have too much excitement in one post now can we? The box contained simple instructions, the adapter itself, and a small square transmitter/receiver you place on the end of the Wiimote (requiring a good tug to remove again!) It doesn’t include the Nunchuck. The adapter takes 2 AAA batteries. The Nunchuck fits snugly into the top, plugs in at the bottom, and the the cable is wound up at the back neatly. 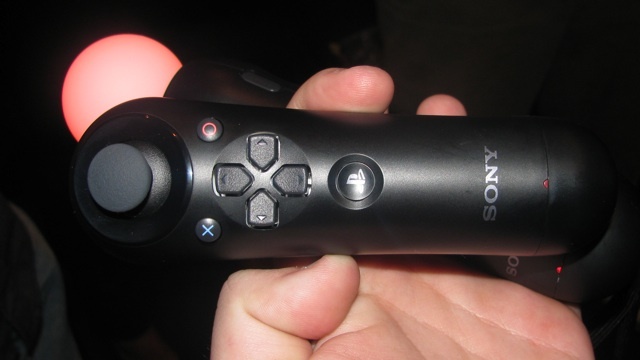 Press the little transmit button to connect it to the Wiimote and a little red light flashes on both. The first game I tried with it was Call of Duty, World at War (Get it! It’s a great game!) For the most part it’s fine and it’s neat not having the cable knocking against you as you play. If I can fault the adapter, I found that sometimes when pulling back on the Nunchuck joystick, the Nunchuck slid back slightly. It’s a snug fit, but could have done with some restraining plastic to hold things in place better. Also, it you have overly large or small hands it might cause problems too but that’s a minor niggle. MadWorld was more fun with the Wireless Adapter fitted to the Nunchuck. No worries about breaking cables any more! I still can’t recommend buying the game though. It got repetitive quickly, I spent my time bashing buttons desperately and wondering how I killed the end-of-level bosses. You're looking so silly Wii Fit! Judging by the reaction on Twitter, Wii Fit hasn’t been a big hit with my friends there. When Mario Kart Wii came out there was much excitement. I happily twittered when I bought my copy, others replied asking what the game was like, or that they were going to buy it the next day “for their family”. Lots of fans there. Of course, Wii Fit has sold over a million units. There must be a Wii Fit user reading this. Is it really fun? Will it last? Woohoo! Someone in the demoscene has cottoned on to the homebrew efforts on the Wii. ExistenzE is probably the first demo to appear on Nintendo’s Wii Console. It’s all thanks to the Twilight Hack which allows developers to run their own unofficial software on the Wii. Basically, the game “Legend of Zelda: Twilight Princess” has a bug in it and developers took advantage of that to load other software without Nintendo’s blessings. So far a lot of the software released has been technical or not very interesting to your average gamer, but Quake has been ported to the Wii, as has SDLMame (updated download) and other emulators.